The Rate Your 8 tool, which is based on Living Upp’s 8-dimensional framework, can help you identify where to best focus your time and energy. But before you can begin designing a healthy lifestyle, you must first have a thorough understanding of what you need to be your best. And that’s not always as easy as it sounds. The truth is, many of us have become disconnected from ourselves don’t really know what we need. Instead, we schlep our way through the workday until we’re completely exhausted, and then return home to a pile of laundry and sink full of dishes. After leaving my corporate job to take a sabbatical in 2015, it took me six months to feel comfortable sitting alone with myself in quiet. I’d become so conditioned to my phone’s incessant dinging and ringing that silence made me feel uneasy. My body understood doing, but not being. I had used work as a distraction from myself for so long that I felt disconnected. But when I started asking myself what I truly needed — and actually listened to the answers — I was amazed at the power I held to make my life more beautiful. Read more about this in an article I wrote for The Costco Connection here. 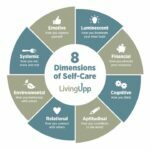 Living Upp’s proprietary Rate Your 8 tool is designed to help you identify the areas of your life that need the most attention, so you can allocate your resources (time, energy, money, etc.) more efficiently. If you’re like most people, you’re probably doing well in one or two areas of your life, but there are others you’ve been neglecting completely. But before you jump into the ratings, it’s important to get familiar with the dimensions so you understand what’s included in each of them. Once you have a solid understanding of how each dimension fits into your life, it’s time to assess how well you’re supporting yourself. How well are you taking care of yourself when it comes to your eating habits? Your personal relationships? Your emotional health? On a scale of 1 to 10 (with 10 being the highest), rank how well your current habits and behaviors are supporting the 8 dimensions. For example, if your exercise routine has become part of who you are and it’s no longer something you struggle to accomplish, then you’d probably rank yourself somewhere between 7 and 10. But if your spending habits are moving you further into debt, then you might rank the financial dimension lower. Don’t overthink it; trust your gut. For additional guidelines on ratings, download the Rate Your 8 Assessment here. And I’ll let you in on a little secret: you’ll probably never be a “10” in any category. Because perfection is an illusion. But perhaps more importantly, because people who select 9’s instead of 10’s see more capacity for growth — and that’s a motivator for higher achievement. So, dear overachieving friends, don’t beat yourself up if you aren’t rocking 10’s in every category. That’s probably a good thing. Once you start using this tool more consistently, you’ll see how your ratings change along with the ebbs and flows of your life. And soon, you’ll be able to predict how your life’s events will play out in terms of your health. The purpose of using a measuring tool is to recognize changes over time so we can allocate and reallocate our resources accordingly. Start with the areas you’ve ranked lowest. If your gut tells you things aren’t going well in a particular area of your life, then it’s probably a sign that something needs to change. Chances are you’ve been thinking about making a change for quite a while, but you just haven’t put any energy into it. Prioritize your plan by targeting the areas with the most obvious needs. Choose fun and unusual activities. As you select your self-care activities, make sure they excite you. We look forward to things we perceive as fun, and higher levels of enthusiasm increase your chances of following through with your intentions. Use your excited energy to your advantage! Don’t expect perfection. Don’t expect 100% from yourself. Perfection is an illusion — don’t even go there. You’ll create more stress for yourself and find a reason to stop trying. Clear your plate. Sometimes self-care involves removing something from your plate rather than adding to it. Setting a boundary, leaving a relationship, canceling a membership. Saying ‘no’ often feels more like saying yes, especially when you’re feeling overwhelmed. Put it on paper. Sketch out your plan on paper or a post-it note and place it somewhere visible. If you carry a planner* or journal*, use your plan as a bookmark. If you find that you often mindlessly grab unhealthy snacks from your kitchen frequently, put it there. Writing down your intentions and reviewing them regularly makes it more likely that you’ll take consistent action. Rate Your 8 every day. Get into the habit of taking your self-care pulse daily on a daily basis. I rate my 8 every morning as part of my morning practice. It takes about 20 seconds to sketch out, and the impact of that simple task sets the stage for my entire day. It helps me identify faulty thinking patterns and strategically weave self-care into my day. Some of my clients carry the 8-dimensional model in their purse, or hang it on their bathroom mirror. Need Some Fresh Self-Care Activity Ideas? Give your self-care plan a makeover by reviewing this list of self-care ideas. During the 2016 leap year, I experimented with a one new self-care activity every single day for 366 days. (Yes, it was intense!) But that experience helped me understand the depth and breadth that exists with self-care, and it helped me identify the activities that best fit my unique needs and personality. The possibilities are endless.